Netgear this week announced the Nighthawk M1 mobile router, which is the industry’s first 4G LTE device with download speed up to 1 Gbps. The Nighthawk M1 is powered by Qualcomm’s X16 LTE modem with 4x4 MIMO announced a year ago and will be available only on Telstra’s 4GX LTE network in Australia. As soon as similar networks are launched in different parts of the world, the same router or its derivatives may hit the market elsewhere as well. 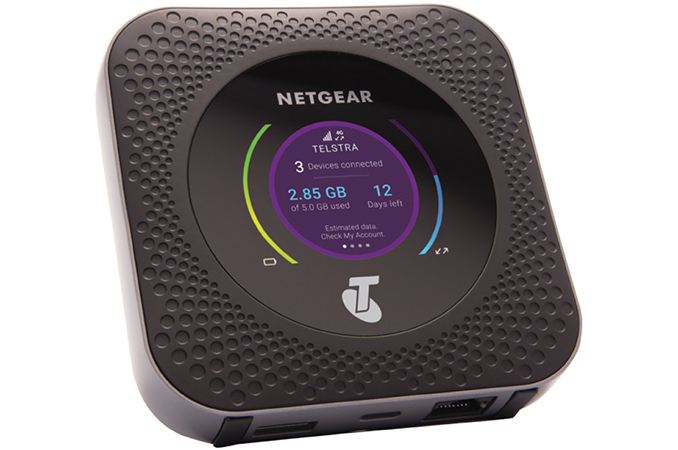 The Netgear Nighthawk M1 mobile router is aimed at those who need to set up ultra-fast mobile broadband connection for multiple people and up to 20 devices in areas where cable broadband is unavailable (there are a lot of rural areas in Australia where there is no broadband). 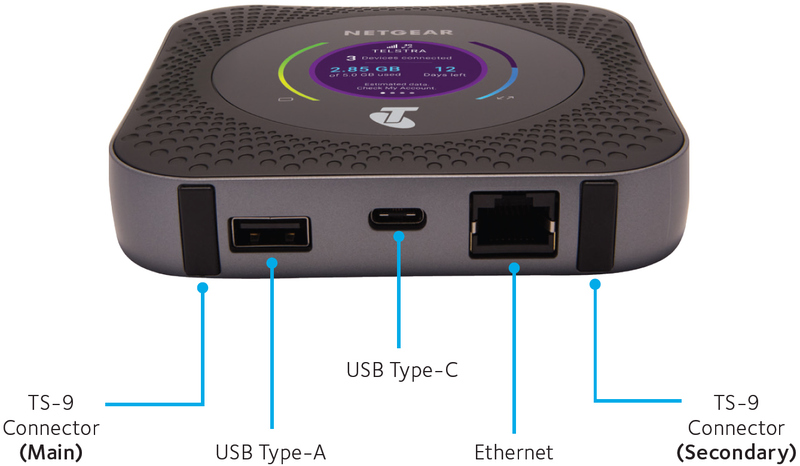 The Nighthawk M1 can be used like a normal portable router (it has a GbE port as well as two USB headers) or as a NAS/media streamer (it has a microSD slot). The router also has an inbuilt battery (5040 mAh) which is rated for up to 24 hours of standard use. The Nighthawk M1 does not require any special setup, but it is equipped with a 2.4” display to monitor its performance/data usage and there is also a special app for Android and iOS that allows a user to manage the router (network settings, parental controls, etc.). At the heart of the Netgear Nighthawk M1 there is Qualcomm’s Snapdragon X16 LTE modem (paired with Qualcomm’s WTR5975 RF transceiver). The modem supports 4x4 MIMO, four carrier aggregation (4xCA) and higher order modulation (256QAM) to download data at up to 1 Gbps (in select areas) as well as 64QAM and 2CA to upload data at up to 150 Mbps over Telstra’s 4GX LTE network (Telstra's network is only 3CA it is worth noting). We already know that the X16 modem will be integrated into Snapdragon 835 SoCs for smartphones, but right now it is available only as a standalone chip. The Nighthawk M1 router is also equipped with Qualcomm’s 2×2 802.11 b/g/n/ac Wi-Fi solution that can connect up to 20 devices simultaneously using 2.4 GHz and 5 GHz bands concurrently. The Netgear Nighthawk M1 (MR1100) mobile router will be available from Telstra in Australia later this month for $360 AUD ($276 USD) standalone. Telstra also plans to offer the router with a range of broadband plans. Because he can and Anadtech's comment system was implemented using technology from the early 1800s. This means there's no option to report such comment and banning is unheard of around here. So far I haven't heard of any unlimited data plans that have no "fair usage policy". All of them get throttled if you (ab)use them. Either someone offers such a plan without any fineprint which I seriously doubt, or we have different definitions of practical usability. Just to be clear, Telstra's current mobile data offering gives you 5GB (as in the article picture) + 2GB bonus for only $50. You can also get 10+2GB for $70. You can also get some voice plans with 30GB at ~$200. When I moved and was without wired internet for a while, all of my 300-800 GB of monthly traffic went through mobile. Nobody questioned it. They even advertize mobile internet to be used as your main internet at home. Well then, when Finland's "unlimited data" ends up in the rest of Europe we may have another discussion :). Unfortunately even that won't help countries with a large population. It's one thing to give unlimited high speed data to 5 million people, quite another to do it for a country of 50, 80, or 300 million. The "unlimited data" part is not really the problem, rather the speed that you can offer to people after all of them decide to jump on the bandwagon.